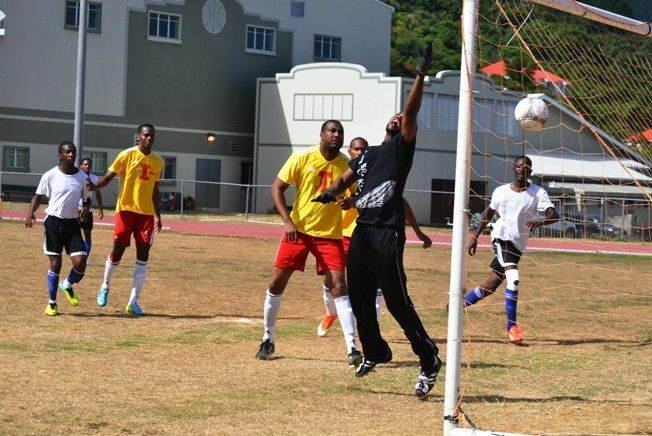 Sunday June 22nd, 2014, – The Islanders F.C. duly completed an unbeaten Premier League Season with a 3-1 win over the Ballstars, whilst the Sugar Boyz overcame a battling Wolues 3-2 to cement third place in the standings. The Islanders have already been crowned Champions following One Love forfeiting last Wednesday nights top of the table clash found themselves a goal down inside the first five minutes when stand in goal keeper, Fitzroy Daley made an elementary handling error inside his own box to gift the Ballstars a free kick, which was deflected by Ranalie Caine past the flapping Daley and inside the near post. Just two minutes later though, the Islanders were level when McTair James was brought crashing down in the Ballstars box and Avondale Williams powered his spot kick straight past Troy Caesar. The Islanders then went 2-1 up, in the 20th minute, following a long run by Noel Isaac, who slid the perfect ball into the path of Andy Davis and who, in turn, expertly chipped the ball over Caesar and into the empty net. The second half saw the Islanders squander a lot of chances with several players guilty of over elaboration in front of goal and a lack of composure, but eventually Caines made it 3-1 in the 70th minute when presented with the simplest of tap ins. The Wolues then played the Sugar Boyz and caught their defense still getting organized when Xavier Arnau Gili slotted home the opening goal in the second minute. The same player had a chance to double the lead moments later, but his flicked effort went agonizingly wide of the far post. However for much of the remainder of the first half it was a sea of Orange in the Wolues half as the Sugar Boyz piled on the pressure. Derol Redhead latched onto a through ball and should have at least hit the target. Wolues Keeper, Nick Messum, made a couple of flying saves from Jeunick Mingo, Roger Roberts and Redhead, but even he was powerless to prevent the equalizer in the 32nd minute when a pinpoint cross from Terry Nanthan was met with a bullet header by Akeem Hendrikson. A sublime touch and first time pass from Nanthan put Roberts through on goal early in the second half and he made no mistake in sliding the ball past Messum to make it 2-1 to the Boyz. Then a Robin Van Persie like looping header from Graeme Willis in the 47th minute made it 2-2, but 15 minutes later Roberts scored his second to restore his teams lead at 3-2. As time ran out Redhead should have made it 4-2, but opted to pass rather than shoot and at the other end Jose Jiminez squandered an opportunity to give the Wolues what would have been a deserved point.